Generates rainbow colored glows based on the distances from the edges of the source input. Any edges in the input image, where the brightness crosses the given threshold value, will generate an equal glow into the darker side of the edges. 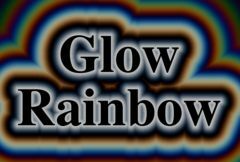 This is similar to GlowRainbow but here the glow colors are also scaled by the Mask input. Frequency: Default: 12, Range: 0 or greater. The frequency of the color pattern. Increase for more cycles through the spectrum. Frequency Red: Default: 1, Range: 0 or greater. Frequency Green: Default: 0.9, Range: 0 or greater. Frequency Blue: Default: 0.8, Range: 0 or greater. If non-zero, the color phase is automatically animated at this speed, causing the color pattern to flow over time. Glow Saturation: Default: 1, Range: any. Scales the saturation of the glow colors. Increase for more intense colors. Set to 0 for monochrome.